because we designed this for a very special lady named Marcia. She works in the floral industry and she was in rehab after very serious surgery when we went to see her. Marcia had no flowers in her room, which was very sad, probably because people think florists don’t like flowers! Please don’t think that! 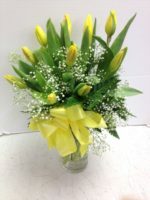 Florists, who work with flowers every day, LOVE flowers or they wouldn’t be in the industry! 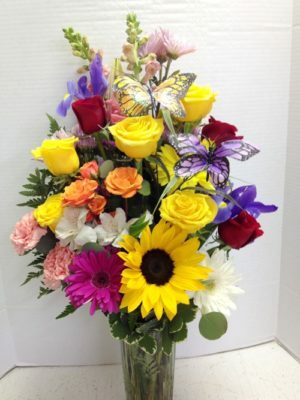 Marcia’s Florals is a pretty mix of flowers such as sunflowers, gerbera daisies, spray roses, roses, iris and other spring flowers. These spring flowers are not always available, and we reserve the right to substitute other flowers for the same look and feel in Marcia’s Florals. 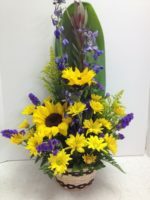 We also recommend Classy Sunflowers or Sensational Birds of Paradise. thank you so much. 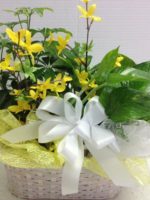 The flowers are very beautiful. My aunt was very surprised.